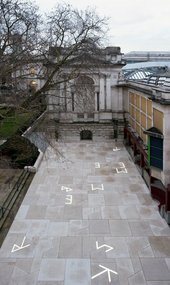 Martin Boyce’s installation outside Tate Britain links the main gallery building with the Clore Gallery, home of JMW Turner’s paintings. It consists of the words ‘Remembered Skies’ spelled out in lights across a paved terrace. With some letters upside down or on their side, the constellation of tumbling shapes deliberately slows down the act of reading. The viewer has to piece together the phrase by walking across the work and seeing it from different angles. Boyce says the phrase ‘Remembered Skies’ comes from the way Turner constructed his compositions. His skies were a combination of the seen, imagined and remembered. This display has been curated by Clarrie Wallis.